What was Franz Kafka dreaming about in his youth when working at Assicurazioni Generali in Prague? What did he write between 1907 and 1908? 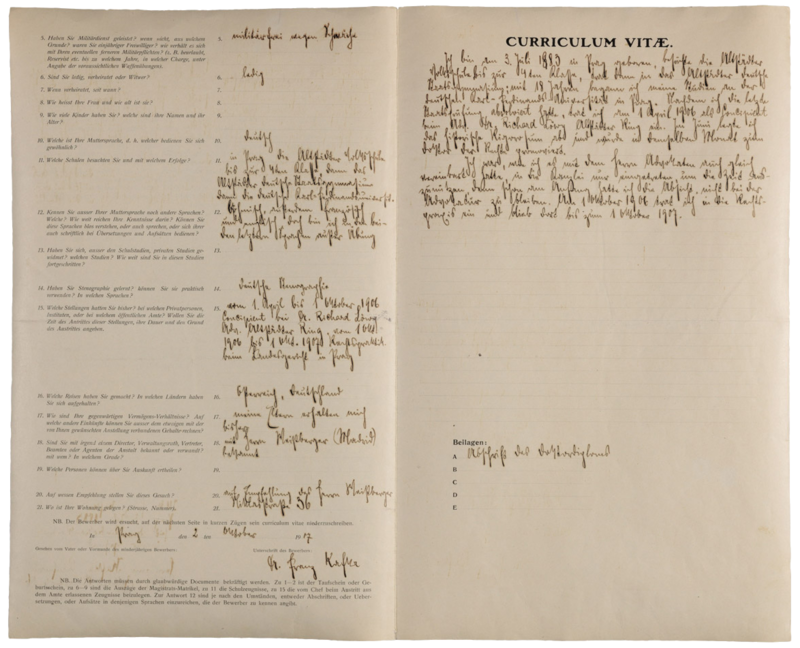 Handwritten documents conserved in the personnel files of the Assicurazioni Generali Historical Archive tell the unknown story of a special clerk: from his signature to his curriculum, to discover the famous writer. 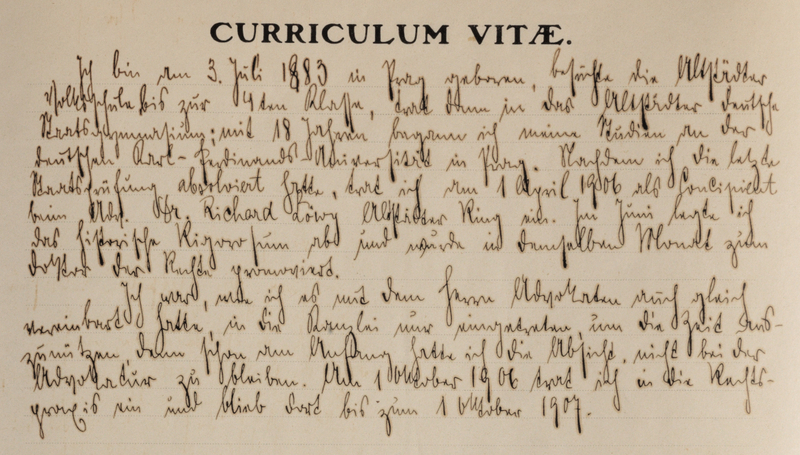 The file for Franz Kafka – hired on October 1, 1907 as “Aushilfskraft”, auxiliary clerk in the life insurance department of the general agency in Prague, and who resigned for health reasons on July 15, 1908 – plays a special role in reconstruction of the youthful years of the writer, as testified to by the biography written by Klaus Wagenbach (Franz Kafka. A Biography of his Youth) and the articles published in the Company’s “Bollettino” in the 1950s: Franz Kafka impiegato delle Generali (Franz Kafka, a Clerk at Generali) in 1952 and Una lettera di Franz Kafka al suo capoufficio presso le Assicurazioni Generali (A letter from Franz Kafka to his Supervisor at Assicurazioni Generali) in 1954. “Now my life is in complete disorder. It is true, I have a job with a tiny salary of 80 crowns and 8-9 interminable hours of work, but I devour the hours outside the office like a fierce beast” (in Kafka’s letter to Hedwig Weiler, October 8, 1907); “In the office. I am at Assicurazioni Generali, but I nourish the hope of sitting one day on chairs in far-flung countries, looking out of the office windows onto sugar cane fields or Muslim cemeteries, and the insurance branch interests me greatly, even though for the moment my work is sad” (in Kafka’s letter to Hedwig Weiler, October 8, 1907).